Comments | [02/15/05] Read it. This book is the best example of what photo-journalism can be by our industry's leading master of the craft. The irony of this book is that all his images were shot for TV, not for magazine or print. 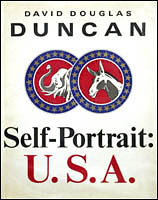 Go figure that when LIFE and LOOK were at the peak, Duncan's work appeared as filler during the late night broadcast of convention coverage. Comments | [02/13/05] In the summer of 1968 I was getting ready for my senior year in high school; already sure that photography was going to play a major role in my life. And even though I didn’t realize the significance of NBC allowing DDD, a still photographer, the facilities and time to present his work -- I was still spellbound by what he presented on the tube during both conventions. 1968 was an incredible year in the United States, and this book reveals some of the polarity of thought and action that was playing out before us. Duncan ended up with more of a story to tell than he could have known when he started the project, and this book is a good companion to those who want some additional insight into that turbulent year, as well as for photojournalists. His shooting style was very much at the leading edge during the 60s and 70s…but most remarkable when you realize that he put those prints up to the camera one-at-a-time during his slots in the convention television coverage. I also recommend his “Yankee Nomad”, which should give you a better idea at how he arrived at “Self-Portrait: U.S.A.”. Comments | [10/12/02] This is THE book that got me into photojournalism. I think that my "style" (if I have one) of shooting tight comes from my loving David Douglas Duncan's book on the 1968 political conventions. Going straight from the jungles of Vietnam to the convention floors in Chicago and Miami, Duncan utilized a (at the time) super-telephoto lens to capture the faces and emotions of the delegates and politicians. Amazing sharpness. Telling images. Straight talk about the scene from the photographer. This is what photojournalism is all about. It's long out-of-print, but available in used houses everywhere. Get a copy. This is a "must-have". Bert Hanashiro.